Q-Waste is a locally owned and operated family business with over 30 years experience in the waste industry. We operate Monday to Friday 7am to 5pm, but can arrange after hours call outs. We also offer Free Quotes and Inspections by appointment. 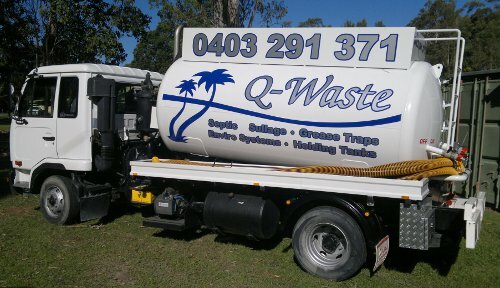 Qwaste is a family owned and operated liquid waste removal business located in Burpengary, on Brisbane’s north side. Liquid waste removal and liquid waste system maintenance and servicing is what we do. However we have operated in almost all areas of the waste management and have over 30 years of experience in the industry. This is why we know we can help you with your liquid waste removal needs. Our services are fully insured and conducted within the guidelines of local, state and federal authorities. Environmentally responsible operation is something that is very important to us, as such we are proud to be approved by the Environment Protection Agency (EPA No. HE/5740/2011/WTRAN). Although it is necessary to conduct our operations within the letter of the law, and we do so every time, we believe the customer is the most important part of our job and this is why we are focussed on making sure you are happy with our service every time we visit you. In these troubling times its nice to know that those who you rely on to keep your home operational and comfortable are striving to do so at the best possible price. As such value for money is something you can expect from Qwaste. Find out now just how competitive we are, call us now for a no obligation free quotation and inspection of your system. When Do I Need a Clean? Don’t know if your Septic Tank or Liquid Waste System needs cleaning, If any of the following sound familiar chances are you need to give us a call, we can help.